The batter should make sure to spend at least two minutes stretching and warming up before this 20 minute workout begins. 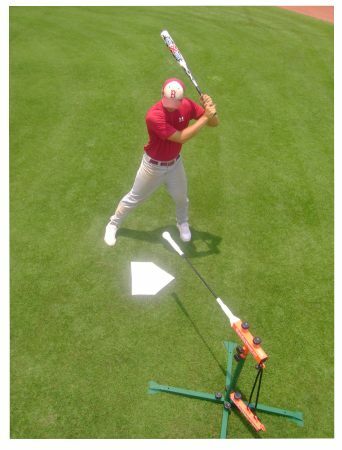 Drill 1 - Top Hand Drill - 10 swings Batter should work fast taking his swings as quickly as possible. Each swing counts whether its a hit or miss. Drill 2 - Bottom Hand Drill - 10 swings Batter should work fast taking his swings as quickly as possible. Take 10 swings only. If you hit or miss the ball it counts as a swing. Drill 3 - Hip-Turner Drill - 10 swings Batter should make sure that the ball is directed at his front side back pocket. The batter should take a swing every 10 seconds. Drill 4 - Inside Contact Drill - 15 swings The batter should make sure that the ball is directed at his back foot in the inside contact position. A swing should be taken every 10 seconds. Drill 5 - Regular Contact Drill - 15 swings The batter should make sure that the ball is directed at his belly button. A swing should be taken every 10 seconds. Drill 6 - Away Contact Drill - 15 swings The batter should make sure that the ball is directed at his back foot. A swing should be taken every 10 seconds.